For the written accounts describing the "Good News" of Jesus, see Gospel. In Christianity, the gospel (Greek: εὐαγγέλιον euangélion; Old English: gospel), or the Good News, is the news of the coming of the Kingdom of God (Mark 1:14-15), and of Jesus's death on the cross and resurrection to restore people's relationship with God. It may also include the descent of the Holy Spirit upon believers and the second coming of Jesus. The message of good news is described as a narrative in the four gospels. The message of good news is described as theology in many of the New Testament letters. It relates to the saving acts of God due to the work of Jesus on the cross and Jesus' resurrection from the dead which bring reconciliation ("atonement") between people and God. Christian theology describes the Good News of salvation in Jesus Christ not as a new concept, but one that has been foretold throughout the Old Testament and was prophetically preached even at the time of the Fall of Man as contained in Genesis [3:14-15]. It is called Proto-Evangelion or Proto-Gospel. The apostle Paul clearly states that the gospel is the death, burial and resurrection of Jesus Christ. (I Corinthians 15:1-4). (Joh 3:15) That whosoever believeth in Jesus should not perish, but have eternal life. (Act 4:11) This is the stone which was set at nought of you builders, which is become the head of the corner. (Joh 14:6) Jesus saith unto him, I am the way, the truth, and the life: no man cometh unto the Father (God), but by me. (Joh 3:5) Jesus answered, truly, truly, I say unto you, Except a person be born of water (Water Baptism, fully under) and of the Spirit (Baptism of the Holy Ghost), you cannot enter into the kingdom of God. (Act 2:38) ...Repent, and be baptized every one of you in the name of Jesus Christ for the remission (forgiveness) of sins, and you shall receive the gift of the Holy Ghost. (Act 2:39) For the promise is unto you, and to your children, and to all that are afar off, even as many as the Lord our God shall call. (Act 10:43) To him (Jesus) give all the prophets witness, that through his name whosoever believeth in him shall receive remission of sins. (Act 10:44) While Peter yet spake these words, the Holy Ghost fell on all them which heard the word. (Act 10:45) And they of the circumcision (Jews) which believed were astonished, as many as came with Peter, because that on the Gentiles (non-Jews) also was poured out the gift of the Holy Ghost. (Act 10:47) Can any man forbid water, that these should not be baptized, which have received the Holy Ghost as well as we? (Act 22:16) And now why wait you? arise, and be (water) baptized, and wash away thy sins, calling on the name of the Lord Jesus. (Act 2:21) And it shall come to pass, that whosoever shall call on the name of the Lord Jesus shall be saved. (Rom 2:4) Or despisest thou the riches of his goodness and forbearance and longsuffering; not knowing that the goodness of God leadeth you to repentance? (1Jn 2:25) And this is the promise that he (Jesus) hath promised us, even eternal life. "Good News" is the English translation of the Koine Greek εὐαγγέλιον euangélion (εὖ eû "good" + ἄγγελος ángelos "messenger" + -ιον -ion diminutive suffix). The Greek term was Latinized as evangelium in the Vulgate, and translated into Latin as bona annuntiatio. In Old English, it was translated as gōdspel (gōd "good" + spel "news"). The Old English term was retained as gospel in Middle English Bible translations and hence remains in use also in Modern English. The written accounts of the life and teaching of Jesus are also generally known as "Gospels". 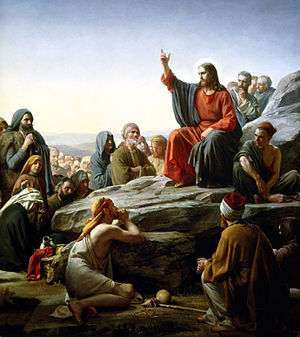 Depicted is Jesus' famous Sermon on the Mount in which he commented on the Jewish Law. Some scholars consider this event to be a completion or fulifilling ("antitype") of the proclamation by Moses on Mount Sinai of the Ten Commandments and the promises and law of God (the "Mosaic Covenant"). Generally speaking, the Gospel of Jesus Christ, or the message of salvation, justification, and sanctification, is explained by the apostle Paul in his epistle to the Romans, especially in chapters 3 to 8. Christian writers and teachers often present the Good News set within the context of the storyline of the whole Bible. This discipline, of understanding the Christian message in terms of Biblical salvation history, is known as Biblical Theology. 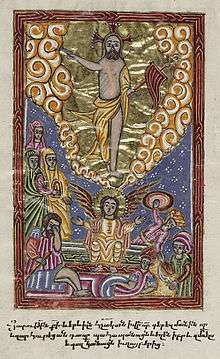 This attempts to posit a connection between Old Testament and the Christian teachings of the good news about the life, death and resurrection of Jesus. The Book of Genesis describes humanity, male and female, as created to be rulers of God's created world (Genesis 1, ). Humanity was given a perfect place in which to live in perfect relationship with God, dependent upon God for all his needs (Genesis 2). Mankind, however, disobeyed God's instructions. This resulted in the breaking of mankind's fellowship with God, leading to spiritual death (Genesis 3, see also Fall of Man) and spiritual and social depravity (Genesis 4-11). Genesis describes how God scattered mankind over the face of the earth, forming the different nations and ethnic groups (Genesis 11). Beginning with the prophet and patriarch Abram (Abraham), God chose specific people to live in obedience and fellowship with him, and blessed them, their land, and their descendants. This was so that the different peoples of the world would receive God's blessing (Genesis 12:1-3; Catholic Encyclopedia: Abraham). The Old Testament writers describe how through the prophets, God revealed that he would send a person who would fulfil the role of prophet (Deuteronomy 18:14-22), priest (Psalm 110:1-4), and king (Psalm 2), in restoring humanity to fellowship with God (see Threefold Office; Catholic Encyclopedia: Salvation). This person would be called the Messiah (the Hebrew term referring to these roles: literally, "anointed one"), "God's son" (Psalm 2:7), and even "mighty God" (Isaiah 9:6). The prophet Isaiah described a servant-like figure, who would suffer because of the offences of mankind against God. This punishment would satisfy God's anger and finally bring peace between God and humanity. After this, he would be brought back to life and be raised to a high position (Isaiah 53:9-14)(See also Messiah; Catholic Encyclopedia: Messias). The author of Luke in the New Testament describes an angel announcing the forthcoming birth of a child who would be called Yeshua (or "Jesus"), the Son of the Most High God (Luke 1:30-36). The writers of the four New Testament Gospels describe Jesus performing signs and wonders in the power of God's Spirit. During his life in Israel, Jesus called people to follow him as disciples. He taught them about the character of God's kingdom: that it was a kingdom characterized by humility, gentleness and peace (Matthew 5:1-10; see also Catholic Encyclopedia: Kingdom of God). The New Testament gospels record the disciple Peter stating that Jesus was "the Messiah, the Son of the living God," (Matthew 16:13-17). Jesus claimed that he would suffer at the hands of the religious leaders and be killed; but would return to life on the third day of these events (Matthew 16:21). He was put to death by being nailed to a cross, and was buried in a tomb cut into rock (Matthew 27). The Gospel writers describe Jesus returning to life from the dead. On the morning after the day of rest (Sabbath), some of the women who followed Jesus went to the tomb, but found it empty (Luke 24:1-8). After seeing Jesus outside the tomb, they announced to the other disciples that they had seen Jesus, having returned to life from death (John 20:10-18; see also Catholic Encyclopedia: Resurrection of Jesus Christ). Jesus told his followers that as "All authority of heaven and earth has been given to me from God, Therefore go and make disciples of all nations, baptising them in the name of the Father and of the Son and of the Holy Spirit, and teaching them to obey everything I have commanded you," (Matthew 28:18-20; see also Great Commission). The Book of Acts describes how Jesus' disciples took this message to peoples of many nations in the Ancient Near East. They taught that Jesus' return to life showed that he was in fact the Messiah (Acts 2:14-41); the way that people are forgiven (Acts 13:36-39); and the one God has chosen to judge the world (Acts 17:29-31). They taught that in response, people should turn from their ways of sin, and be baptised in the name of Jesus, receiving forgiveness and God's gift of his Holy Spirit (Acts 2:36-39). In the same way that Jesus was brought back to life, all who believe and accept the opportunity to join his people will also be raised to everlasting life in God's kingdom (1 Corinthians 15:1-24). Even in nations to whom God did not originally send the message, people are now able to believe in Jesus and join his people (Acts 11:1-18; Acts 15:7-9). The disciples also maintained that it is not necessary for Gentiles to be brought under the Judaic Law of Moses (via circumcision) in order to accept and follow Jesus (Acts 15:10-21, Catholic Encyclopedia: Judaizers see also Council of Jerusalem). The Bible closes with images in the Book of Revelation of the future destiny of humanity: a great crowd of people, from all nations, tribes, people and languages, stands worshipping before the throne of Jesus (Revelation 7:9-17). They are made clean and holy through the death of Jesus. There is a new created order, described as a great city, where God lives among his people, and there is no more crying, tears or pain (Revelation 21:1-4). The good news is described in many different ways in the Bible. Each one reflects different emphases, and describes part or all of the Biblical narrative. Christian teaching of the good news — including the preaching of the Apostles in the Book of Acts — generally focuses upon the resurrection of Jesus and its implications. Sometimes in the Bible, the good news is described in other terms, but it still describes God's saving acts. For example, the Apostle Paul taught that the good news was announced to the patriarch Abraham in the words, "All nations will be blessed through you." (Galatians 3:6-9; c.f. Genesis 12:1-3). Liberation theology, articulated in the teachings of Latin American Catholic theologians Leonardo Boff and Gustavo Gutiérrez, emphasizes that Jesus came not only to save humanity, but also to liberate the poor and oppressed. A similar movement among the Latin American evangelical movement is Integral Mission, where the church is seen as an agent for positively transforming the wider world, in response to the good news. This can likewise be seen in black theology of certain African and African American Christians. The Christian missions movement believes the Christian good news to be a message for all peoples, of all nations, tribes, cultures and languages. This movement teaches that it is through the good news of Jesus that the nations of humanity are restored to relationship with God; and that the destiny of the nations is related to this process. Missiology professor Howard A. Snyder writes, "God has chosen to place the [worldwide] Church with Christ at the very center of His plan to reconcile the world to himself (Ephesians 1:20-23),". "God's plan for the [worldwide] church extends to the fullest extent of the cosmos. By God's 'manifold wisdom' the [worldwide] Church displays an early fullness of what Christ will accomplish at the conclusion of all the ages. The spectacle is to reach beyond the range of humanity, even to the angelic realms. The [worldwide] church is to be God's display of Christ's reconciling love,". ↑ The Proto-Gospel, by R. C. Sproul. ↑ Luther and the Christology of the Old Testament, by Dr. Raymond F. Surburg, p14, saying: "Messianic prophecy has its origin in Genesis 3:15, which has been called the "protevangelium," the first Gospel promise. It was spoken by the LORD God ( יְהוָה אֱלֹהִם ) to the Serpent, used by Satan, in the hearing of Adam and Eve." ↑ The Lutheran Study Bible, p20, "3:15...This points to Christ and His defeat of Satan on the cross, and for this reason this verse is often called the 'protevangelium' (the first promise of the Gospel)"
↑ Worldwide Mission: The Work of the Triune God, by Dr. Paul Peter, p3, saying "After the Fall of man (Gen. 3) and its dire results, the loss of Paradise (3:23f. ), death by sin (3:3; Rom. 5:12), and the cursing of the ground (3:17), preceded by the Protevangelium (3:15), the first revelation of the missio Dei, the Scriptures continue with the generations of Adam and the names of all the patriarchs from Adam to Noah..."
↑ Evangelism is the spreading of the evangelium, i.e. Christian proselytization, see also the Great Commission. Evangelicalism is a 20th century branch of Protestantism that emphasizes the reception of the "good news" by the individual (see also Low church), in contrast to the traditional and historical emphasis on the communal aspect of the Church's guardianship of the authentic Gospel (see also High church) as crucial to the salvation of the faithful (Extra Ecclesiam nulla salus). ↑ The section in italics above is simply a brief summary of the teachings of the Bible writers: it is not a quotation from a secondary source. Dodd, C. H. 1964 The Apostolic Preaching and its Developments Harper and Row. Goldsworthy, G, 1991, According to Plan: The Unfolding Revelation of God in the Bible Sydney: Lancer Press. Johnstone, P, 2001, Operation World, Carlisle, UK: Paternoster Lifestyle. Köstenberger, A and P. O'Brien, 2001, Salvation to the Ends of the Earth: A Biblical Theology of Mission New Studies in Biblical Theology 11, Leicester: Apollos. Padilla, R, 2004, 'An Ecclesiology for Integral Mission,' in The Local Church, Agent of Transformation: An Ecclesiology for Integral Mission, T. Yamamori and C. R. Padilla, eds, Buenos Aires: Kairos Ediciones. Snyder, H. A., 1999, 'The Church in God's Plan,' in Perspectives on the World Christian Movement, 3rd edn, Pasedena, California: William Carey Library.